The most extensive history [nearly four decades] of implementing temporary water control solutions around the world. The knowledge and expertise protecting critical infrastructure, as well as commercial and residential property gained during that time is unparalleled. Working with owners, engineers and property managers, our team of exceptional, safety-minded professionals draws on that extensive experience to identify the unique, site-specific requirements of your project. This in-depth understanding enables Portadam to create the most innovative, robust and cost-effective solutions for your property. Portadam offers you the level of service and support you desire. 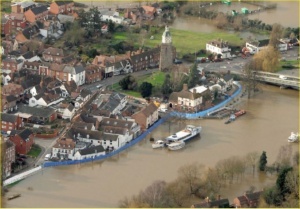 First and foremost, we offer the expert flood protection knowledge on a consultative basis. Additionally, we have the ability to provide a detailed floodRISKdatasm report on your location based on proprietary scientific analysis. 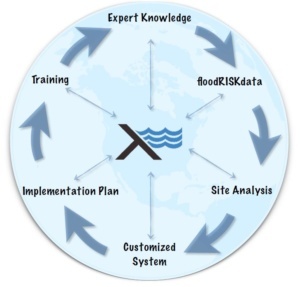 A comprehensive flood protection implementation plan can also be developed by our expert team. We can then design and deliver the best flood protection system to protect your property. Our experts can provide initial and subsequent annual refresher training to your on-site team to ensure proper deployment when required. If needed, we have the teams to install and remove the customized system. You have the flexibility to select the best combination of our full-service offerings to meet your exact requirements. Our portfolio of modular, engineered systems enables custom configurations. Flat and level is never the norm. The flexibility engineered into our flood protection systems allows us to utilize components with different heights to accommodate varying surface elevations and obstructions. Our site surveys allow us to customize a solution to conform to the specific conditions of your location, giving you the confidence that you will be deploying the best temporary flood protection system possible. Quick setup & removal and reusability of our systems are unparalleled. The time it takes to setup and to remove the system is a fraction of that of sandbags/supersacks and other labor intensive systems. The crews and equipment requirements for deployment are significantly less as well. In contrast to rudimentary methods such as sand bags, our systems are reusable and don’t require additional time and costs that are inherent with disposal logistics (cleanup/transport/dumping) of sandbags or other fill-based devices. Designed for a long life, the systems are constructed of high-quality, durable steel or lightweight aluminum. The life expectancy of the core components of our system is many decades. The resilient impervious fabrics can be deployed and reused many times before replacement is a consideration. This reduces the annualized cost of protection significantly. Compact design for ease of storage, transport and deployment. The systems are engineered in a manner that allows for transport to a location and onsite with ease. The design is such that the systems require the minimum amount of storage space for the maximum amount of protection near high risk areas. 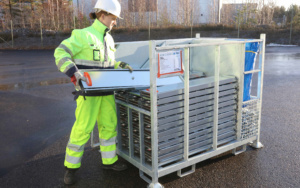 For example: 164 linear feet of 40” height protection can be stored in a single 4’ x 5’ x 4’ portable, stackable crate and deployed in less than 30 minutes. 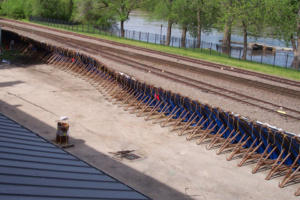 The US Army Corps of Engineers has fully tested and vetted the Portadam system. 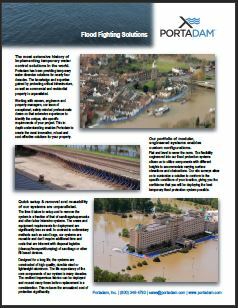 Results of tests were so convincing that they decided to purchase and include the Portadam system in their arsenal of flood fighting tools. The British Standards Institute has awarded the Kitemark to the Geodesign Barrier for quality. Additionally, the British Army has been trained for rapid deployment of the system.